At that time, Adams was one of only three women of the 30 to 35 students in the general robotics, automation, sensing & perception (GRASP) laboratory at the University of Pennsylvania, and one of the first to graduate with a PhD. “While there are proportionally more females graduating in robotics than there were in the past, we still see significantly fewer women—and under-represented groups in general, than Caucasian and Asian men in robotics today,” she said. “Additionally since there are so many robotics companies these days, you have good opportunities that didn’t exist even 10 years ago,” Adams said. 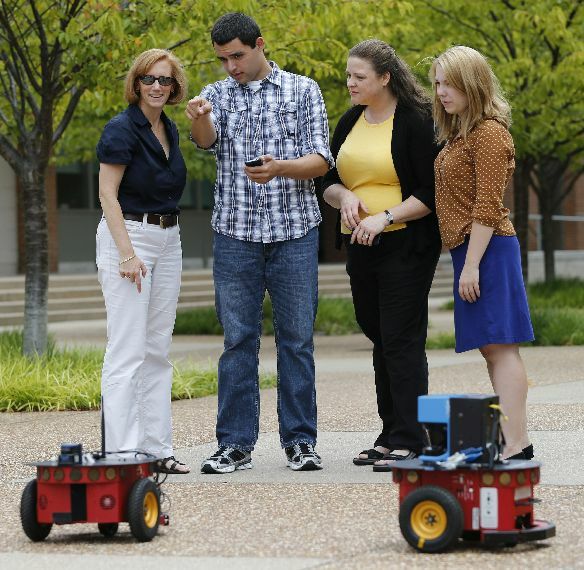 Adams previously worked in industry but now runs the Human-Machine Teaming laboratory at Vanderbilt University, leading research on human-robot interactions, such as a single human supervising teams of robots or direct one-on-one interactions. She hopes to improve these interactions by focusing on data from wearable sensors on the humans, which could monitor electrical brain activity or skin conductance, to detect changes in cognitive or physical workload and adapt the robot’s behavior accordingly. “We’ve focused on first responders for mass casualty, and chemical, biological, radiological, nuclear and explosive device events—situations where you would want to deploy multiple robots,” Adams said. “The other aspect of our research is developing intelligence capabilities for multi-robot systems, such as human-swarm interaction,” she said. One of the current crop of female robotics PhD students is Elaine Short who is majoring in computer science and working in Maja Mataric’s Robotics and Autonomous Systems Center (RASC) lab at the University of Southern California. Short began her undergraduate studies in biomedical engineering, but after her first computer science class, she was hooked on coding. With no background in the field, unlike others who may have had experience in high school or earlier, Short said felt like she might not be “good enough.” Now she’d like to encourage women, underrepresented minorities, and anyone else who might be struggling with learning to code. Eventually Short caught on to coding and was offered an undergraduate fellowship at Yale, publishing a peer-reviewed paper on her research. At USC, she now works on using robots to improve group learning with children, especially in groups including one or more children with developmental or learning challenges. When she came to USC, she was the only woman PhD candidate in computer science, Short said, and the RASC lab currently has quite a few more women than men, though the incoming 2016-2017 class is evenly balanced. “If you want to increase the number of women in an organization, it helps to have women in leadership,” Short said. Kristi Morgensen is one such female in leadership. Morgensen is a professor and associate chair for academics in the Department of Aeronautics and Astronautics at the University of Washington. She is also part of the UW robotics, controls and mechatronics group. Morgensen and her research team are working with biologists to learn how organisms, such as insects, birds and bats, sense the world around them and react to the information—for example, to change their direction of flight. They hope to use their results to help drones navigate a forest full of trees, or maintain course on a windy day. According to Morgensen, living organisms use a wide variety of sensors, including visual, acoustic (like bat sonar), mechanical, biomimetic (hair flow), or even chemical. “Animals have lots of small simple sensors, whereas engineered systems tend to have smaller numbers of sensors and they tend to be more complex, which also makes them susceptible to failure,” she said. Morgensen said she’s benefitted from great mentors, both male and female, but there are still challenges to being a woman in a STEM field. One of those challenges did not become evident until she gave birth to her children. Morgensen recognizes that differences in personality are always a factor, and some of these issues are always going to exist between people who have children and those who don’t. “In general things are slowly changing for the better, and the whole balancing of gender is not something that’s going to change in 5 years or 10 years—it requires generational changes,” she said. 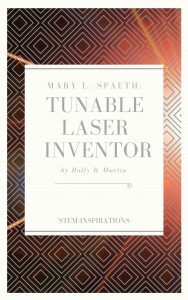 This entry was posted in Blog, Blog and tagged Robotics, STEM, STEM careers, Women in Science and Engineering, Women's History Month on December 9, 2016 by Holly.